Wow Andrea, thanks for sharing this video it has encouraged me to practice some more yoga, even when I’m a really beginner I know that great feeling of practicing it! Whoaa! Those are pretty “extreme” poses. Although i love many of the things about yoga, i now have si joint issues and a labral tear from doing yoga for the past 12 years. Wake up yogis to the risks you are taking. Many of these postures are not healthy. I agree with Michealle above. Read her book…YogAlign. It’s a new and healthier approach to a lifetime of yoga. Your body is worth the extra care…do you want to end up with hip replacements, si joint issues, and painful labral tears and impingements. It may not happen right away, but with time believe me, it will. SI joint pain is chronic once it begins; I sincerely hope the prolotherapy works for Richard Freeman. Thanks both for your thoughtful comments. I agree, ashtanga yoga has its issues. I’ve started with it many years ago and quickly figured out that it’s not for me. I’ve done a lot of sivananda and very slow vinyasa, leaving out quite a few postures that cause discomfort. I posted the video regardless of the type of yoga, wanting to underline that once you start out on the yogic path changes off the mat tend to occur as well (e.g. change in eating habits, posture when walking or sitting, sleeping patterns…). In no way did I intend to advocate a particular system of yoga – apologies if the post gave this impression! Thanks Andrea for letting me know you were not advocating the yoga, just the philosophy. The practice of these extreme yoga poses if done repeatedly with the force shown in this video can definitely ruin your life. When Richard Freeman said how annoying airplane seats are when your back has to curve backward and your head is thrust forwards, the video shows someone doing a crow pose variation with the lumbar spinal curving backwards and the head thrust forward. Is this a joke? This video made me feel sickened to see the ways that people are contorting the body and forcing their joints into hyperflexion and hyperextension. I read in Yoga Journal that Freeman has torn his SI joint ligaments and needed prolo therapy. Haha! This is so true! I’ve not worn jeans just yoga pants and the odd skirt in over six months because I must always be prepared to break out the yoga and stretch. I also never thought I would enrolled in Kundalini Yoga Teacher Training nor that I would move to Vancouver to take said training. It kind of has a life of its own now that I’m following with meditations and yoga flowing out of me at a high level currently and a new fascination with this practice (where can I take a full time yoga course I’ve begun to ask!). I have been checking out your blog and it’s really inspiring to me. I’ve just begun a blog on my yoga journey at mysticyogini.wordpress.com and I hope that my blog stays as consistent and true to the practice as your posts and writing are. I ruined my life way back in college and I’m looking forward to continuing to ruin it with yoga throughout my retirement and right up until I draw my last breath. I saw this video a coupe of weeks ago and I found ti very interesting. 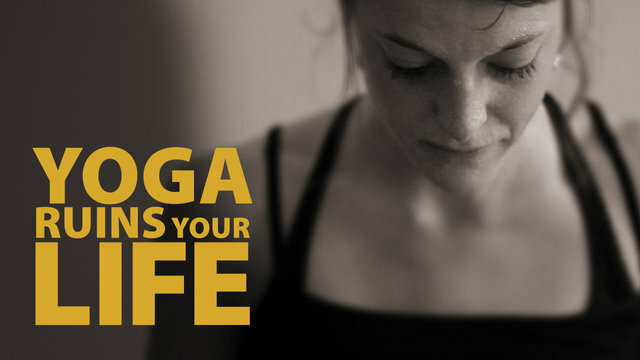 Yoga only ruins your life if you are planning to have a “normal” life! Hahahaaa!!! Lmao! I love this video. I am just so grateful that my pre yoga self’s attitudes and beliefs- which inhibited me from living and loving beyond constructed boundaries- are indeed ruined and replaced by healthier alternatives! Thanks for sharing. Yes, my life is ruined. I have often said that the bad thing about yoga is once you have a practice, you then know how bad it feels to feel bad! On a segue, you changed your blog no? Even the name. I’m not seeing things right? Yes, I felt after two years it was time for a change – and for a theme that gives me more options. I’m glad you like it, any suggestions please let me know! So true!!! It’s funny how I plan my life around yoga now! Oh I know! But then it doesn’t really feel like a sacrifice to me… I’m also lucky to have such an understanding environment, tolerating all the incense, yoga chant music, shiva statues on the chimney….and of course dinner at 6 pm so that I won’t feel too full for early morning practice. Since I go to evening yoga making dinner is difficult. My hubby has the timing down pat! He makes dinner so it’s ready when I’m done with yoga! What a great man eh? A great video, very true. I’ve been practicing Yoga for 3 decades now. I’m very blessed to have found these transformational processes so young. I’ve been reflecting recently on how they ‘saved’ my life in many ways.